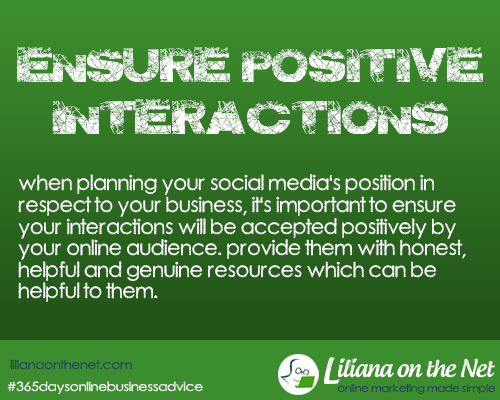 When planning your business social media’s position it’s important for you to ensure your interactions will be accepted positively by your online audience. You want to provide them with honest, helpful and genuine resources which can be helpful to them, either personally or for their own businesses. You need to answer questions and truly interact. If you have this personal interaction with those who frequent your social media platforms, you are not only helping them with their own personal situations. You are providing yourself with a presence online. This presence is one your readers, customers and potential clients will grow to appreciate, and knowing you’re aware of what’s going on and reaching out to provide guidance or clarification whenever needed shows a lot about the kind of business you run. Once you have created your account, it is important that you build a name for yourself in the chosen field first. Once you have made a niche, you should go ahead and interact with other members. It is important that you export your personal bookmarks to that website. In your website, groups and pages. Do share interesting articles and posts from other Marketers, content is King and if you provide useful articles and solve problems you will be successful. Try and maintain a social relationship with the users, keep the lines of communication open and keep in touch with the users. You must research other successful pages and groups in your social media marketing. While writing content for your site, make it interesting. People want to know what you are feeling, so make sure that you give this to the people. You must know everything about your customers, demographics, age, preference. The content you post in your blog and share in social media should arise intrigue to know more and interest. Call to action are a must. Not everyone is going to agree with you, that’s fine but as long as you have researched and know your topic, do not panic, just explain your position. In case such a situation arises it is best not to respond immediately and to wait for a while. You should never attack the person if they don’t agree with you. Attack the argument. I’ve been in Facebook since 2008 and I did join some political groups and I could not believe how people try to attack me, if they did not know, they made something up? Try and keep your responses concise, simple and also professional. When you are replying to a controversy it is important that you do not get over emotional. Quote exactly what the person had written and then explain your point and what you think is wrong in what was written. But don’t forget to show the real you. People in social media and in blogs want to see the real person behind the posting. This is a great checklist, Lilian. Each point can even be posts within themselves. Thanks for taking the time to put it together and to share it. Thank you Julie, I am trying to give value. I am glad you liked it. Social interactions leads to engagement which ultimately leads to relationship. What most businesses need is relationship with the customers or clients. This helps to build trust which can frequently triggers participation or conversion of leads. So, I totally agree with your checklist Liliana! Great checklist. Nice to someone give solid advice and making it simple to remember. Shared.